In which the cast is introduced and the scene is set. 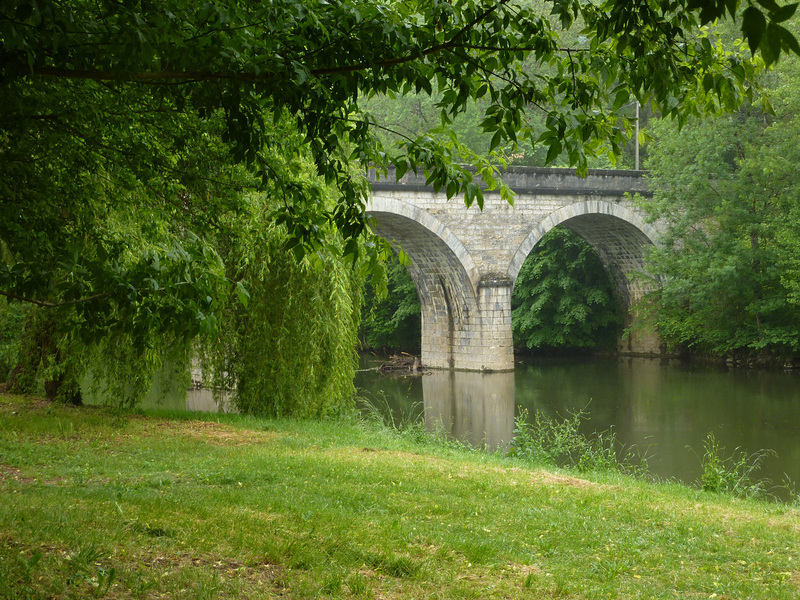 These are some reminiscences of days on the river in the Lot region of France. I shall be mixing up stories from my first trip, eight years ago, to the trips we did last summer, about thirty trips in all. This entry is about the first day of the Célé trip, where we arrive on the train from Paris (or at a regional airport) at Brive. A short drive to the Célé valley at Marcilhac for a picnic lunch and then continuing onto our B&B on the Causse above the valley. Standing on the railway platform at Brive we wait for the train from Paris to pull in. It’s 1pm and we’re hoping that our guests have managed to catch the 9am departure from Paris Austerlitz and have made it all the way here without having been shuffled down the branch line to Perigeaux – sometimes the train divides at Limoges and on one occasion we have had a guest on the wrong half! If our guests have not made the 9am departure then we will have to wait until the 2pm to see if they made the 10am departure. Standing on the platform can be a nervous experience. We are wearing our team T-shirts and I’ve got my ‘outfitters’ hat on. If I’m in the mood I might also be carrying a canoe paddle. This is just so to make us look like we are your guides for the trip. If all goes well we will meet safely on the platform, introduce each other and get all the luggage and paraphernalia loaded into the back of our minibus ready for the journey south to the Célé Valley. It should take us about 90 minutes. At first we will snake out of the city of Brive, passing numerous and wildly decorated roundabouts before descending to the motorway that heads south. The first part of the journey will be a dull motorway drive. But let’s try to get it over with. Soon we will leave the motorway and ease ourselves onto the slower, winding roads that cross the Causses. The drive will take us along some obscure byways across the plateau until eventually we will drop in to the deep valley. There is not much to see along these roads. Drystone walls and overgrown sheep fields, small villages with large churches. The occasional pond. 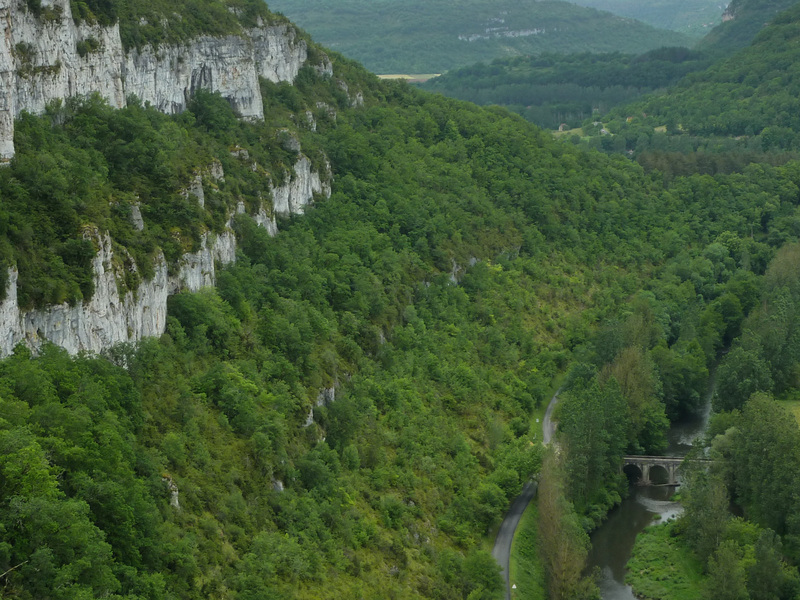 When the road does eventually start to drop down into Marcilhac we can see the limestone cliffs on the other side and the small tree-lined river meandering along the valley floor. In the past we used to stay in Marcilhac and that was handy for our travels by canoe. For some reason though we no longer use the place. At one time the Chambre d’hôte we did use was being run by an old person. I remember she was famous for her extensive home-made jams which were available at breakfast. All sorts of flavours. But then she retired and was replaced by a younger woman who soon let the place deteriorate. Eventually we could use it no more. Anyway we take a break here at the village and park under the sycamores in the square and walk down to the lawned river bank to find a picnic table. We set up the picnic by spreading a table cloth and laying out the breads and cheese and pates and meats. We slice some vegetables and make a quick salad and make sure we have some fresh fruit on the table too. Normally we open a bottle (or a box – as it travels better in a canoe!) of wine and everyone can sit down together and enjoy a glass of wine and a simple lunch. It’s warm and sunny and we can relax to the point of sleepiness. Before we drop off though and before everyone wanders off to look around the old church and the ruined abbey in the village I get the maps out and go over what we shall be doing in the next few days. It’s not difficult. We shall canoe down the Célé! Depending on how much time we have left of the afternoon, and remembering we shall be back in the village tomorrow I’ll suggest that we only have so much time to wander around before we should hop back into the van and get on our way. It’s only a short drive of about 20 minutes or so. We have to drive further down the valley to the next village of Sauliac, across the bridge and up the steep road the other side to a little hamlet and beyond that a small farmhouse all on its own. This is Richard and Helen’s place. They’ve spent ten years running a B&B here and first spending many years re-building the farm which had become a ruin. We are welcomed into the house and shown our rooms. The guests can repair straight to the small swimming pool. A tiny affair built into one of the old barns. We relax here for an hour or so having a couple of beers, before going back to change and dress for dinner. Richard does the cooking. Well, the main course anyway. Helen does the starter and desert. First however Richard invites us to taste one of his home made aperitifs. How about a Fenelon? This is a potent mixture of Red Wine, Cassis and Walnut Liqueur. How about Vin Noix or Vin Chataigne. After chatting a little while with our drinks we are invited to table. It’ll be an interesting evening as the food is good and the wine is free and Richard will take over the role of host. The conversation flows back and forth, the subjects touched are not divisive, and everyone seems happy in the warm atmosphere. Even if the subject area does slip into religion or politics nobody seems to be taking the points made in a personal way. This is good because from time to time things can get a bit hot and sometimes in the past the subjects have got a bit hairy. Richard seems to be good at steering the conversation away from any dangerous places and is quite self-effacing if it appears to him that he become too insistent in his opinions. It’s a real pleasure when the evenings can be like this. It can be a nightmare when you have guests who take offence at everything. It can be worse if we have guests who have no conversation at all. Fortunately that doesn’t happen often. At the end of the meal Richard treats those that want it to a fiery digestif of Eau de Vie. Probably something that’s been distilled in the back yard. But that’s another story. This entry was posted in Inn-to-Inn Guided Canoe Trips and tagged Canoe, Célé, France, Guided, Holiday, Inn-to-Inn, Lot, Marcilhac, nature, outdoors, Trip, Vacation on January 2, 2014 by Green River Canoes Ltd. In which we go canoeing for the first time. These are some reminiscences of days on the river in the Perigord region of France. I shall be mixing up stories from my first trip, eight years ago, to the trips we did last summer, about thirty trips in all. 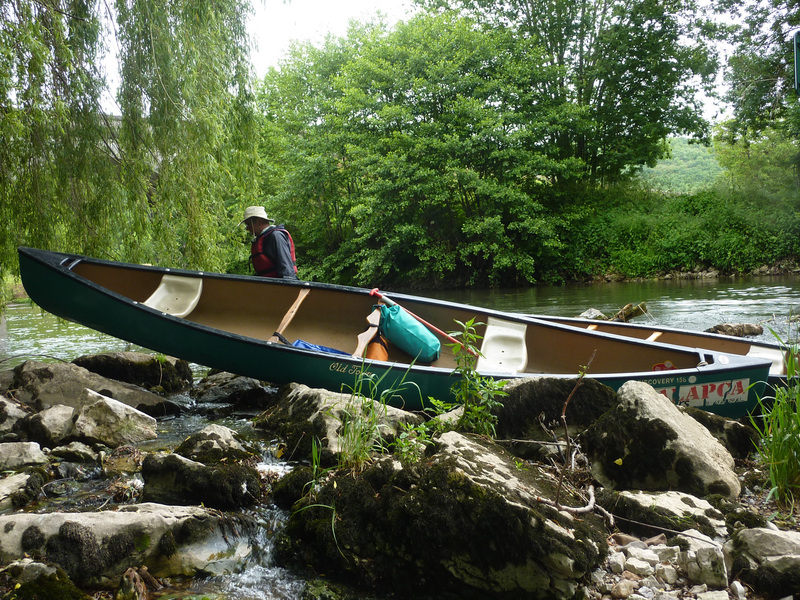 This entry is about the second day of the Perigord trip, where we go canoeing together for the first time. The next morning everyone gathers at breakfast. A simple affair. Juice, coffee and croissants. The mood is good and the weather looks fine. Paul and I go over the day. We’ll do a short canoe trip in the morning and then visit a cave shelter in the afternoon. And then we’ll see if we can fit anything else in. Some of us are going to walk down to the village but before we do that we have to ensure that everyone has the gear they need for the day organised. Dry-bags are issued for stuff to carry on the canoe. Also walking shoes and extra clothes can be put in the van for use later. It’s a rigmarole explaining what to take. Wet weather gear, cameras, phones, wallet, sunscreen, hat and all the other bits and pieces. It’s important to explain that all the stuff should be ready to hand. Even a change of clothing in case you fall in and a fleece or something as the cave can be chilly. It’s the first day so I try to be patient. They’ll get the hang of things in a few days and van will turn in a tumbling mass of everyone’s gear. Paul and I have pulled out the picnic gear that we’ll use for our lunches and have loaded up the cooler with stuff from the fridge. Two frozen water bottles will accompany the wine box. Those that are walking with me then set off down the hill. Like last night its an easy walk. The lane is interesting as we pass several houses. Nobody is about. Not even a rabid dog. I’m thankful no-one is clacking down the road with walking poles. What’s that all about. I never really get it. Have to be careful though as some people have dodgy knees and need them. Still hate the clack clack clack though. Lower down the hill we pass some fields on our right. they’ve already been cut for hay which is a pity as earlier in the season they are waist high with grasses and flowers and it’s a great spot for photographing butterflies. Early in the morning I’ve often found Marbled Whites still roosting at the top of long stems of grass. Sometimes a Common Blue too and from time to time Six Spot Burnets in their red and black livery. Just before we come to the crossroads at the entrance to the village we pass Louis Dega cycling back up the hill. He’s wearing his customary outfit: dungarees, Wellington boots, floppy hat and wire-rimmed spectacles. He looks all the world like Dustin Hoffman in Papillon. That’s Louis Dega. We’ve been seeing him on this stretch of road for a couple of seasons now. Always on this road, up or down, always on his bicycle and always dressed the same. We wave and smile and he waves and smiles too. We have no idea who he his or where he lives or what he does. He just is. A familiar and strangely reassuring sight. In seasons past we’ve had other Degas. At one time we had a strange chap who used to be seen walking the road between St. Leon and Montignac. He was walking one way or the other clutching a carrier bag. He walked with a slight hunch and stoop. In the last season we saw him he had started wearing a luminous visibility jacket. We can only presume someone had given it to him. It looked dangerous as he was always carelessly walking along the main road. And then one season he was gone. We missed him, but now we have a new Dega. We’ve christened them all Degas now. Every village has it’s own Dega. We have a theory about that now and we look out for them. Possibly in the back of our minds we have ambitions to a be Dega ourselves. Paul tells me about the Dega in his village back at home. He’s called Dan and is often to be seen riding around on a mower. It’s a John Deere. That’s important as he’s very loyal to the brand, as many of these guys are. He’s loyal to no end for certain brands; trucks and sports teams for example. He wears Boston Red Sox hats, socks, shirts and gloves. He works hard and appreciates real friendship. He’s a bit slow but “knows” people well particularly when someone is using or belittling him. He speaks with a high nasal voice. He’s 62 years old, wiry and thin with bowed legs, but he’s strong and just does the work he needs to do with no complaint. He has simple pleasures and a singular purpose in completing the task at hand. He’s a man of few words, but if you show an interest many words will spill out and keep coming. He has, as they probably all do, some odd hobbies and habits. I reminisce about Mr Fox, the fellow that used to wander around my village at home in Kent. He actually worked for the council doing various bits and pieces around the village. He pushed a hand-cart full of his gardening tools. He had a cleft palate and so talked funny. Kids in the village used to tease him mercilessly and imitate his voice cruelly. He was liked though I think and I knew him too as a fixture in the local church where he was a churchwarden. What is that strange pole thing that churchwardens carry in church sometimes? Also what is a sides-man? Arriving in the village we stroll over the bridge and down into the canoe place. I remark that the bridge was designed by Eiffel of Eiffel Tower fame. It’s a simple truss bridge built with iron girders and rivets. I was once told this was an Eiffel bridge but I can find no evidence or documentation. The canoe place is a grassy sward next to the river with a huge pile of canoe and kayaks, obviously, and a marquee where we find Philippe who greets us like long lost friends. He’s a bear of a man and built like a rugby player. We’ve learnt in the past that he has canoed for France in sprint events. He’s all smiles as we get everyone a paddle and a life-jacket. We look at the river, which is running more swiftly than we thought past the pontoon. This is where we finish for the day so don’t go sailing past I remind everyone. Normally on the river we stick together but sometimes people like to go on ahead. That’s fine by us as long as they understand that they will have to deal with any obstacles themselves and woe betide them if they miss the place where we will stop for lunch or the take-out point for the day. It has happened. We have had irate clients. And when it does we have to take the criticism on the chin. ‘I told you so’ just doesn’t cut it. Anyway we pile into the van for the short run up to Montignac where we will start todays paddle. On this first day we could have two guides on the river but Paul has decided not too and will instead rendezvous with us at the lunch spot in Sergeac. In the van I forget to remind Philippe not to take the back road over the bridge in Thonac. 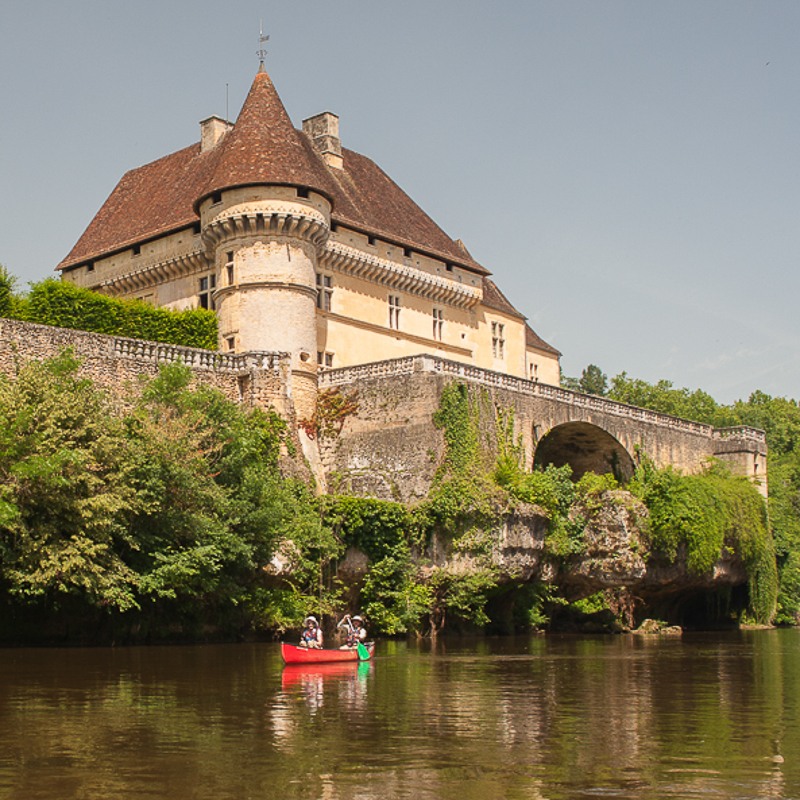 It’s annoying as the road runs alongside the river and gives pleasant views and passes one of the picturesque Châteaux we will pass on the canoes. I don’t like to have the clients get a preview like this so I chat away and try and distract them from looking. Ten minutes later we are in Montignac and I help Philippe unload the canoes and get them lined up on the small beach below the ramp. Before we start off though we decide to have a wander around the village. Some of the clients are ready for a coffee. I have to go to the bakery to pick up bread for the picnic. Back at the boats it’s time for the safety talk. This is always a bit problematic because many of the clients are experienced paddlers and because the river is so soporific it provides almost no dangers. Even so I step in and remind them of the procedures for falling out, for avoiding strainers (trees trapped in the river) and for preventing your boat getting pinned on rocks. I remind them too of the essential paddle strokes and who is responsible for what in a tandem canoe. Two people in a canoe always provides scope for tensions and I’m hoping that we don’t get too much bickering on the first day as people get used to paddling together. In the past I remember having to separate only a a few couples because they were both incompetent. All in all people generally get on. Besides some people like to bicker. At the waters edge I’m the one to get my feet wet as I hold the canoes steady as people get in and I push them off with instructions to hang about whilst everyone gets in the water. You have to laugh at the number of clients who will avoid at all costs getting their feet wet. How can you go on a canoeing holiday and not expect to get your feet wet is beyond me. Even if they have speciality canoeing shoes they don’t want to get them wet. If I’m in the mood I’ll get them wet for them. Not today though. Not the first day. May be later when I’ve had time to figure out how they’ll take it. Finally I’m the last to get into my boat and we are all in the water. I’m paddling solo. So is Mitch. He’s specifically requested his own boat as usually, if we have an odd number of guests, I would paddle with them. Not this time though. It’s better really as I can then concentrate on guiding and generally either lead the way if I ascertain that’s what the group wants or linger back and get in the sweep position behind everyone else. Either way works and in any case usually I flit between the two. To start with I get everyone to get close together and raft up. That is, all the canoes are lined up alongside one another and being held together by holding each others gunnels. Gunnels I said! I explain that we don’t have to hang close together, but that if you go out in front you are on your own and have to make your own decisions about which part of the river to follow. The river is quite low so if you make a wrong decision you might run aground and have to walk the canoe a bit. You’ll get your feet wet then. If you want, I say, we can play follow the leader as we progress down the river. In any case if you get too far ahead and haven’t seen anyone for a while it might be an idea to wait and let the rest catch up. Nobody wants to miss the lunch stop. Just before I let the raft break up I mention some of the animals and birds we are likely to see. Kingfishers, Wagtails, Dippers and Herons as well as the ubiquitous Mallard Ducks. We’ll see other woodland birds and perhaps some raptors too. As for mammals I point out that we’ll be lucky to see anything at all but to look out for Coypu (Nutria), which was introduced from South America, and the Otter. I’ve seen a Mink before and sometimes you see Red Squirrels in the trees on the river bank. I’ve also seem Martens and on one memorable occasion a Fox trotting down the bank in parallel to me. I point out that it’s quite unusual to see these as the noise we make will make them hide long before we approach. We will also see plenty of damselflies and dragonflies along the way and butterflies will cross our path. We will probably hear frogs but not see them. I mention that I’ll be happy to answer any questions about the wildlife and also any about the wild-flowers and trees we will see. I point out that we have reference books in the van to check any ideas and to look up anything we are unsure of. And then we are off swinging into the current and trying to avoid being swept under the overhanging trees on one bank where the current seems to be taking us. It’s a beautiful day. It’s quiet. No-one else is on the river. Not even a fisherman. We start to see some of the birds I was mentioning. The Wagtails are most common and easy to spot with the characteristic undulating flight they have. When on the ground they also have the the little wag dance as they flick their tails. Usually we see the Grey Wagtails, which are disconcertingly yellow. They have a grey head though and the Yellow Wagtails have yellow heads. The Pied Wagtails we sometimes see are black and white as you would expect. Kingfishers are about too, though they are normally only seen by the canoe at the front of our flotilla. They are easily disturbed and fly off in fast straight flights about a foot off the water. They can be hard to see except when the metallic blue colour gets caught in the sunlight. We push them down the river, until finally, they can get back upstream by cutting a bend or flying over our heads. It’s only then that we get a glimpse of the orange-red chest. When the river speeds up a little over quick riffles we catch sight of the Dippers. A small black bird with a white chest. They have a bobbing action when on the ground and also a straight and direct flight. 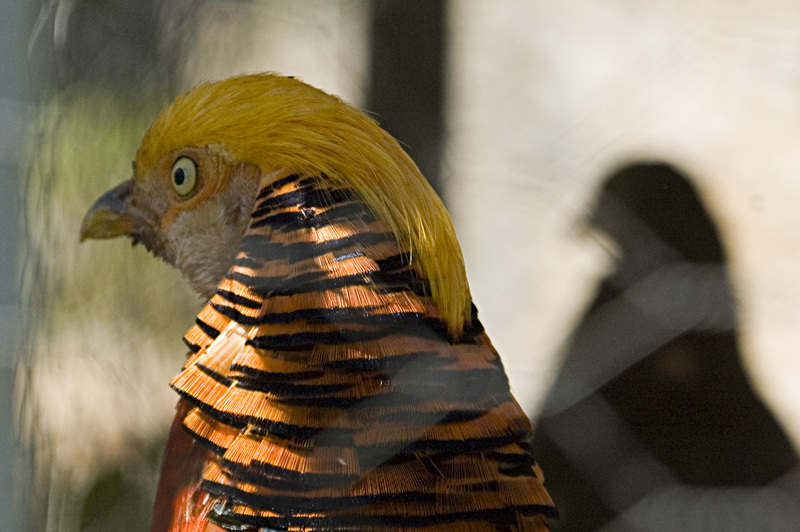 these birds are rumoured to feed by dipping underwater looking for insect nymphs. I haven’t seen this though. From time to time we disturb a Grey Heron who we also push downstream. They lazily fly a few yards before getting disturbed again. They never fly far and though they are usually silent after being moved on a few times they have a good croak and a moan. They too will use a bend in the river to get back to their territory although sometimes they will roost high up in the trees and wait for us to pass. For a large bird they are strangely difficult to get near. Usually they are seen in singles but in the breeding season they come together in Heronries and one time, on another river, I saw seventeen all at once turning slowly on a thermal above a cliff. 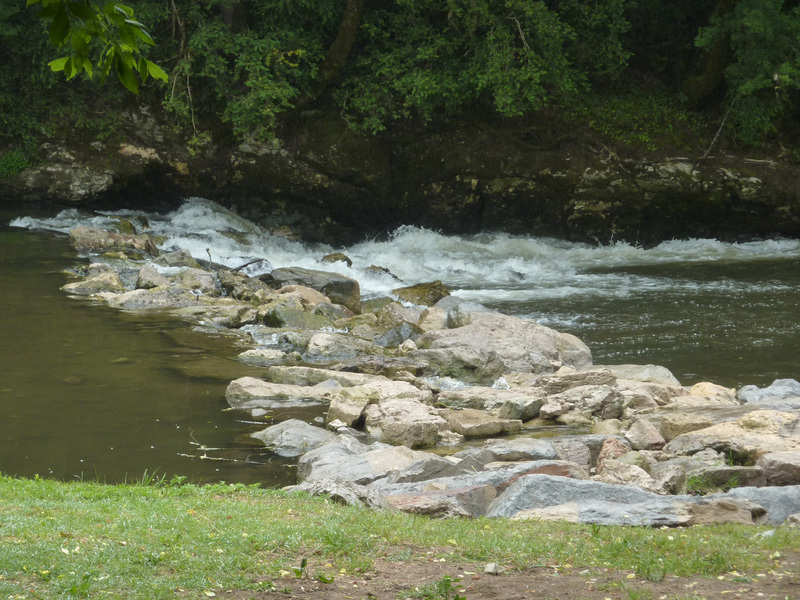 The Vezere river is easy to paddle, it’s chocolate coloured water taking us slowly downstream. From time to time we cross sides to take the deeper water running on the outside of the bend. Novices will often try and cut the corner and then be surprised by running aground as the stream runs shallow. A few minutes later we paddled around a bend to come across our first Château. This is the Château de Losse, but, first in front of it we come to the remains on some old locks. On one side of the river the lock gates remain intact, though the wooden gates have long gone, and on the other side the remains of a broken wall is all that is left of the dam that blocked the river. In former times the river was the means of transport for goods downstream to Bordeaux and the coast. Perhaps wine was being taken down. I’ve been unable to find any information about these locks. Three of them are evident between Montignac and St. Leon-sur-Vezere. I imagine they were built during the heyday of canal building in the 1750’s as the major canal systems in Great Britain and France were. The locks on the Lot river date from the 1770‘s. They are not insubstantial and must have been built to a high standard to have lasted this long. I can only suppose that they were built to control the level of the river for transport and that, at that time, the roads were impractical. The three locks here are built fairly close to three Châteaux too so I’m wondering whether tolls were charged by the local land-owners for boats to pass. I have no idea what type of boats they were either. I’m assuming they would have been of a very shallow draft and probably poled downstream. Perhaps they were pulled by draught horses, although there is not much evidence of a canal path these days. 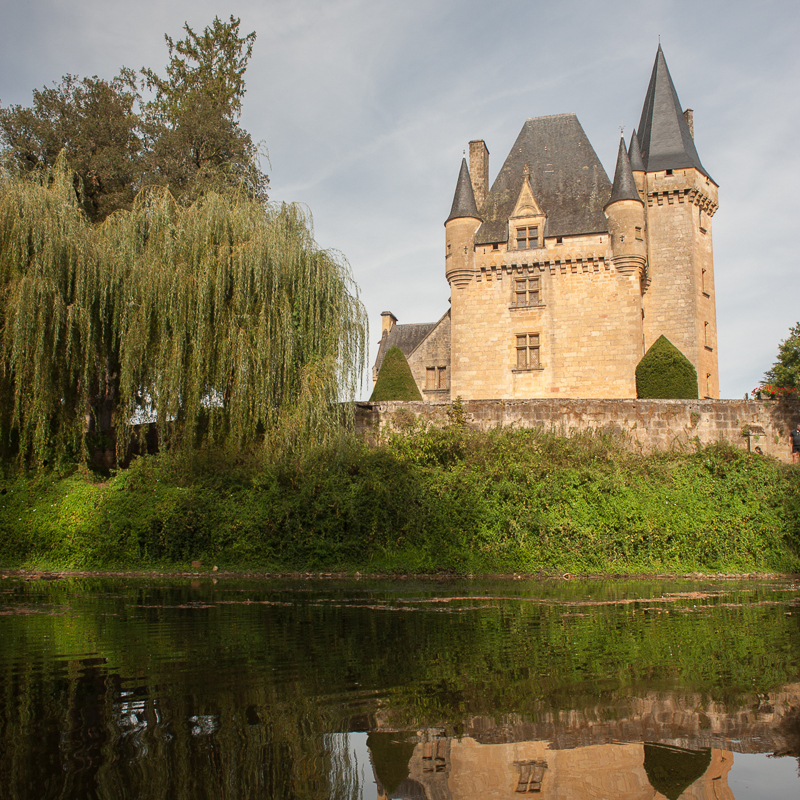 The first thing to notice about the Château is the way it is built right on the edge of the river. It seems to hang over and in fact a curtain of long ivy conceals a overhang into which we paddle. Inside the sunlight gleams green through the ivy and the caustic light glistens on the roof of the overhang. It’s a good place to rest awhile and I’ve used it before in the past to shelter from rain. Not today though. In fact it’s cool under here. It looks like you could disembark here and make an entrance into the castle. But in fact you can’t. The Château is open to the public but they have made no provision for visitors arriving from the river. A pity. Pulling out from underneath the ivy curtain we spin around to get a better look at the Château. Research has told me that the Losse family came here from Flanders in the 11th Century and built a stronghold here. In 1576 a Renaissance Hall was built, by Jean II Marquess of Losse, inside the medieval fortress and nothing much has changed since. The religious wars at the time meant that he improved the defences of the curtain walls and barbican. Over the entrance you can read the inscription “Man does as he may, Fortune as she will”. And so the river swings on as we pass underneath the bridge at Thonac and catch a glimpse of the Church of St. Pierre with it’s strange open belfry. Later we come across another lock. This is the best preserved and the easiest to access so we swing across the river and paddle into the old lock gate from the down stream end. There is just enough room to turn around. We examine the brick work and can see the slots where the gates fitted and the grooves where the hinges sat. In another few minutes we turn another corner to come across the Château Belcayre which is also built on a small cliff overlooking the river. This château is more dramatic than that at Losse as it’s built on a jagged spur which sticks out over the river giving it a more dramatic look. It’s history is vague though. 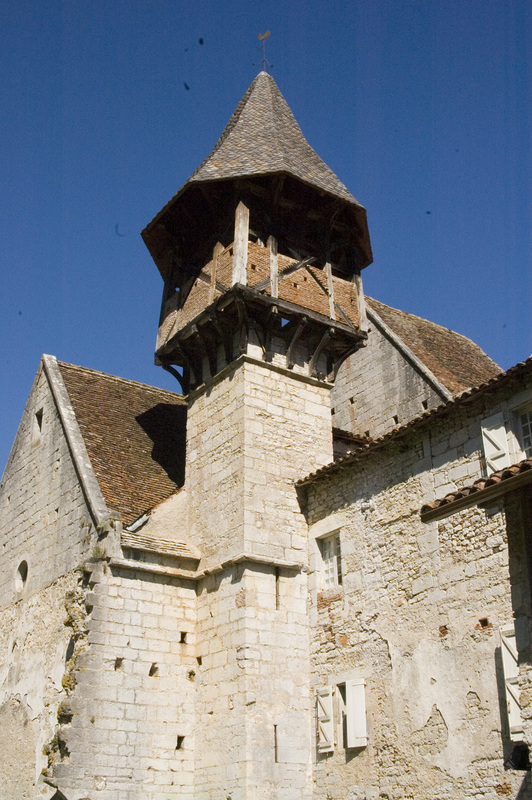 All I can find out is that it was built in the 15th Century and repaired in the 19th century. I can find no information of who owned it during what time periods. I do know that it is privately owned now. The ‘Keep Out’ signs on the lawns are testament to that. 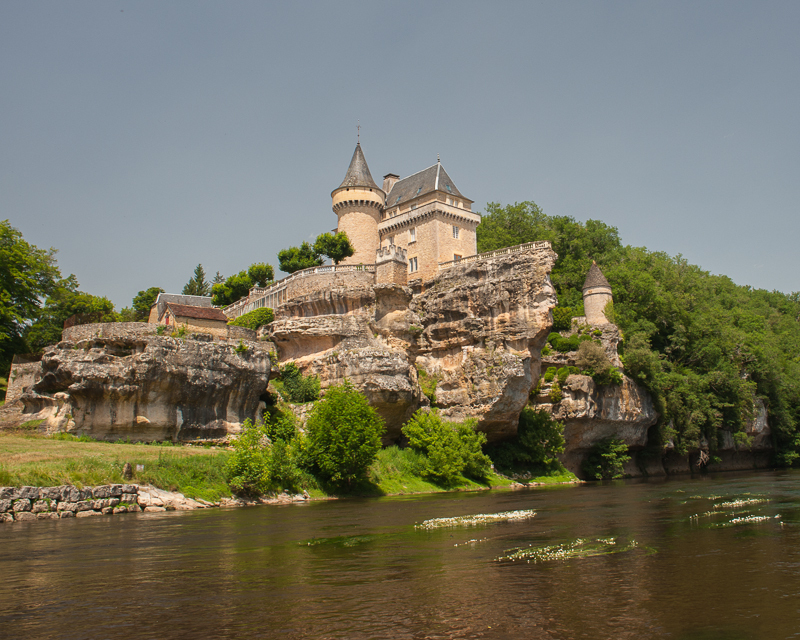 These châteaux are stunning though and even if I’ve paddled this river many times I still like to see them. It’s hard to think of new ways to photograph them though. I think I should come back on a hike and see them from another perspective. As we spin our canoes around for one last look at the château we must be careful not to get caught up in the overhanging trees. It’s no matter really as the river is so slow we can brush underneath the branches and get ourselves into the main stream again. After the excitement of the architecture on the river our attention goes back to the wildlife as we disturb the birds along the river bank. Before long however the river curves to the right and undercuts a cliff and starts to speed up. A little care has to be taken here not to get the canoe too close to the edges of the limestone where the river has sharpened the edges. This quick rush is soon finished however and we find ourselves at the rocky spot where we have to pull over for lunch. I tell everyone to slow down and give each other room as I go first, jump out of the canoe and pull up onto the rocks so it doesn’t float away. Then each of the canoes comes in one at a time and I help them disembark, collect the gear they need and tie the boat to the next. Pretty soon all five boats are tied in a fanned out loop and in turn tied to a small fishing punt which is chained to the bank. We scramble up the trail to find Paul is here and has set up lunch on a picnic table. We are at the small village of Sergeac and at the end of a tiny lane is a path down to the river and here, sitting two metres above the water, is a single picnic table set amongst a stand of White and Black Poplars. Beside us is a small stone commemorative thing which seems to be a Madonna. It think it’s supposed to mark a spring. In any case I tell people that the village has a toilet, give them instructions to find it, and tell them lunch will be ready when they return. I pass around the chemical hand-cleaner to those that remain. When did we start using this stuff? I heard tell that its completely useless at killing germs, but people seem to be mollified by its use. Lunch is the usual combination of French bread, cheeses and sausages with some salad vegetables thrown in. Actually we make an effort to make it look respectable and though we, Paul and I, are used to eating this kind of stuff, the clients are excited and compare it favourably to what you would expect at a picnic on the other side of the water. It’s a small thing to introduce local cheeses and some things not normally found on the dinner table at home. The wine normally goes down well too, whether we have something from down the valley, say a Bergerac, or something from the Lot: A Cahors. A pleasant lunch makes everyone relax and get to know each other better. Remember it’s still the first day on the river. Paul has been up to see Isobel at Castel Merle. This is a pre-history shelter site on the banks of the Vezere river between here, Sergeac, and St. Leon. We’ve visited it many times and it provides an interesting introduction to the caves of the Vezere. This river is famous for having been a centre for human habitation for tens of thousands of years. We will visit other caves in the area but this local shelter gives a more intimate perspective. Paul has said that it would be a good time to go the shelter now after lunch rather than later after we finished our paddle. We can go now, take our time, and finish off the paddle later. It’s little more than forty minutes on the river from here anyway. Everyone agrees with this and after tidying away the picnic stuff everyone, except me, bundles into the van for the five minute drive to the site. Sometimes we walk from here, but Isobel wants to fit us in now. I’m staying behind to look after the boats and mind my own business. I might have a snooze. I might take some photographs. I might have a walk into the village. In fact I do all three. And read my book for a bit as well. They spend hours up at the shelter which gives me ages to mess around here. Sergeac is the tiniest of villages. I walk up the lane and walk the circle of tiny lanes that comprise the village. As usual the church in the village is huge. Unusually though it is open and I step into the coolness inside. It is surprisingly plain. Some of these local churches are decorated very extravagantly, but this one is on the plain side. I do wonder why the churches are so huge though. Was is a function of the size of the congregation or something to do with the largesse of the local benefactor? And so many churches. The country must have been overrun with country priests, or vicars or parsons. Not now though. These country churches are now lucky to have one priest between the six of them, and lucky to have a service more than once a month. I’m surprised that the municipal authorities have stumped up the cash to build some public toilets here. This village is well off the tourist map. It’s almost off the map and the road that reaches here is a no-through one. Somebody has some money somewhere because Thonac, the village on the other side of the river, has also seen some improvements. All the footpaths and roads were tidied up only a year ago. A cynic would perhaps suggest that the EU is wasting money as usual. On the other side of the village I step into the a museum built into a small house. This is the museum put together by the Grandfather of Isobel who is the 4th Generation of the family to be managing the Castel Merle shelter. It was discovered by her great-grandfather. This tiny museum has a rather dusty collection of arrow heads and flint tools. Many of them were found here, though the best examples have gone to the National Museum of Pre-History at Les Eyzies. In addition it seems that he has traded other stone tools from around the world for the sake of comparison. You really have to be into pre-history to enjoy this place. Outside is a table strewn underneath with chipped bits of flint. This is where he practices making his own stone tools: chipping away with a leather sheet in his lap. Of more interest to me is a little alcove where he keeps a motley collection of birds nests. He has never told me how he acquired these. Whether he collected them himself or perhaps whether he collected them as an itinerant schoolboy. This is what I think. I imagine too that the little scoundrel collected birds eggs but these perhaps are a little bit too sensitive to put on show. He’s about the same age as my own father. He too collected birds eggs as a child in the 30’s. I did too in the 50’s. Back at the boats I wander down to the river bank to see what’s going on. A few damselflies are about so I get my camera out and attach a macro lens. With a little bit of patience and care I manage to photograph both the female and male of the Western Demoiselle. They are sexually dimorphic; e.g. the sexes look different. The male is metallic blue with wings which are clear with a broad black band near the tip. The females are metallic green with golden coloured wings. Both handsome. The males seem to be more active as they fly about whilst the females seem to stay more tucked into the vegetation. I’m dozing at the picnic table when the rabble return. They are genuinely pleased by what they have seen at the Shelter. I learn that this year Professor White, from New York University, together with his research students and other academics have dated the oldest known painted surface in Europe. It’s been dated at 37,000 years old. People, both Neanderthal people and Cro-Magnon people (us) have been living in this river valley for that long. They also enjoyed the spear throwing that Isobel shows them. Spear throwing with that bone implement which makes the flight harder and longer. I can’t remember what it’s called. Anyway after everybody settles down I get to the boats and untie them one at a time and get them going again on the water. It’s a tricky start as the water is flowing quite fast here, but pretty soon every one is on there way. 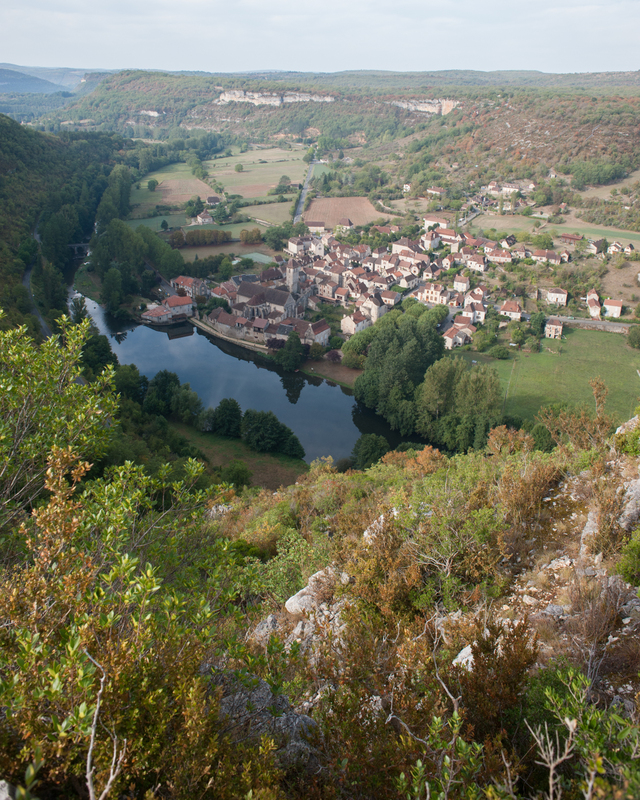 We pass the bend where Castel Merle is and can see the small stream trickling into the Vezere. We can see nothing of the site. Next up is an opportunity to paddle down the side of an island. Very often this is too shallow to do but today the narrow side of the island provides a speckled and sunlight passage through to the other side. We only disturb a few Mallards during our passage. After that we pass the third of the old locks before coming upon our third Château of the day. This is the Château Clerans at St. Leon-sur-Vezere. Again not much information is available about it. It’s 15th and 16th Century and it’s privately owned and so cannot be visited. You can get a good view from the river as you get parallel to it but both before and after it is obscured by trees. It’s not that large, merely a single square building with two towers, one of which is strangely flattened off. Shortly after that the village comes into view with the Weeping Willows and the picnic tables where we had lunch yesterday. A few people are here today too and a small child is throwing a stick for a white dog. We slip by the church, admire the cliffs on the other bank where we have seen children jumping before, and then pass under the Eiffel bridge. Paul is there at the take-out to help catch the canoes and get everyone out of the water safely. Soon we are dragging the boats up the bank, putting our paddles and life-jackets away and flipping out boats over so that we can use them tomorrow without waiting for Philippe to be around. We’ll need an early start tomorrow. So what shall we do now? Everyone votes for a stroll back across the bridge to the cafe in the village for an ice-cream or a beer. The sun is shining. Everyone is in a good mood. The day has been interesting and fun. Not too much and just enough. Half an hour later we hop into the van and drive up to the Relais. It’s again time for me and Paul to relax. But maybe a swim in the pool first. And may be another beer too. That evening we drive back out to Sergeac to the small Auberge de Castel Merle. It’s located right above the shelter we visited earlier in the day. It’s a strange place really. A cross between a gite and a hotel, but we’ve eaten here before and usually come back once or twice a season. We come here because they have an amazing outside terrace with tables that overlook the river from on high. In one direction you can follow the river past Sergeac itself and in the other you can see the river as it flows towards St. Leon. All around you can see the wooded valley of the Vezere. As the sun goes down it can be spectacular. We settle down with some aperitifs: It’s time to taste the local Vin Noix or perhaps a Chataigne. These are made by flavouring red wine with walnuts and chestnuts respectively. The recipes include a dash of Eau de Vie too just to up the alcohol content a little. The menu here includes Wild Boar Stew and this is often a popular choice, but the classic Confit de Canard and Magret de Canard are available too. The confit is a duck leg slow roasted in duck fat and the magret is breast of duck, usually served quite pink. At this point on the trip we are not yet overloaded with duck. It wont be long though as duck will be available at almost every meal. The meal goes down well with several pichets of wine and the talk turns to the plans for tomorrow. That’s easy. We will do some canoeing and we will visit some sights along the ‘Valley of Man’. We will in fact see how this river has been occupied by man for 40,000 years. This entry was posted in Inn-to-Inn Guided Canoe Trips and tagged Canoe, France, Guided, Holiday, Inn-to-Inn, Montignac, nature, outdoors, Perigord, Sergeac, St. Leon-sur-Vezere, Thonac, Trip, Vacation, Vezere on March 1, 2013 by Green River Canoes Ltd. These are some reminiscences of days on the river in the Perigord region of France. I shall be mixing up stories from my first trip, eight years ago, to the trips we did last summer, about thirty trips in all. I’m attempting to be self-deprecating in these stories and I really hope nobody takes offence. This entry is about arriving in Brive for the first day of the Perigord trip. St. Leon, I was still only in St. Leon. I lay in bed looking up at the ceiling where a fan wasn’t spinning. I’m in France, not Saigon. “Everyone gets everything he wants. I wanted a mission, and for my sins, they gave me one. Brought it up to me like room service. It was a real choice mission, and when it was over, I never wanted another.” Who was I kidding? I’m here to guide a river trip down a couple of rivers. I’m working for a canoe outfit and we have some guests over from the USA. It’s not really going to be anything like a river trip on the Mekong. Still I’m hoping it will be an adventure of some sorts. Yesterday I left the comfort of my friends in Paris and took the slow train down to Brive. I drowsed and slept as I generally do on the train. It wasn’t a TGV and it wasn’t busy and I didn’t have to engage in any bonhomie. Outstanding. A French word came out. I imagine I shall have to get used to it. After Limoge I start to notice the landscape. After Uzerche a river appears tumbling and falling in a narrow valley. It’s the Vezere. It looks a bit fierce. Fortunately it calms down further downstream. At Brive I was met by my colleague and co-guide Paul. Actually he’s the boss and I’m just the gopher. Forget the gopher. I’m the water-rat. Which is just as well as Paul knows all the ropes and I’m the rookie. Cripes I’m a bird too. No matter. Paul has been here a day already and has laid the foundation for the trip. We have a minibus, we have picnic gear and we have a collapsible canoe on the roof. I look suspiciously at this as it looks remarkably insubstantial. I fear that this will be my boat. I think I’m ready for this expedition. I have canoed before, in fact I canoed only last October and it’s May now, but it’s long time since I paddled with any frequency. I barely know one end of a canoe from the other. Fortunately Paul seems confident in my ability and has assured me that the rivers are not raging torrents but really little more than quiet green streams. It’s going to be like “Wind in the Willows”. Which is all very well but I will have other problems too. We have guests. Worse than that I am expected to look after them, to accompany them on the river, to help them learn to paddle and to tell them something of what’s going on around them. It’s not possible to brush up on one’s social skills without being sociable. I shall have to do my best and jump in the deep end. No, not the deep end. Paul has convinced that though the guests will be from the USA they will be able to understand me. I’m English. He has also reassured me that it’s a general rule that people who are prepared to come on a canoeing holiday are quite easy-going and friendly. In any case they have paddled before and know full well about the vagaries of travel on the water. He’ll be doing all the hard work in the background and all I have to do is get them, and the canoes, from one place to the next. A small matter of paddling downstream for four or five hours. Without losing anyone. I’m apprehensive of course. I’ve never had a job like this in my life. But would I rather be sitting at my deck looking at a computer screen or here in France profonde with the early summer sun on my back. I don’t think so. I’m ready. I’ve got the shorts and boots on. A short-sleeved shirt and a hat that’ll protect me from the sun and float on the river when I lose it. Time to meet the guests. To accompany us on the trip we have three couples and Mitch. Mitch tells us he’s from Nevada. The couples are Erin and Ryan, Tom and Nancy, and Mary and Joseph. We just introduce ourselves to each other as we meet them off the train and bundle them and the luggage into the van. We are off. 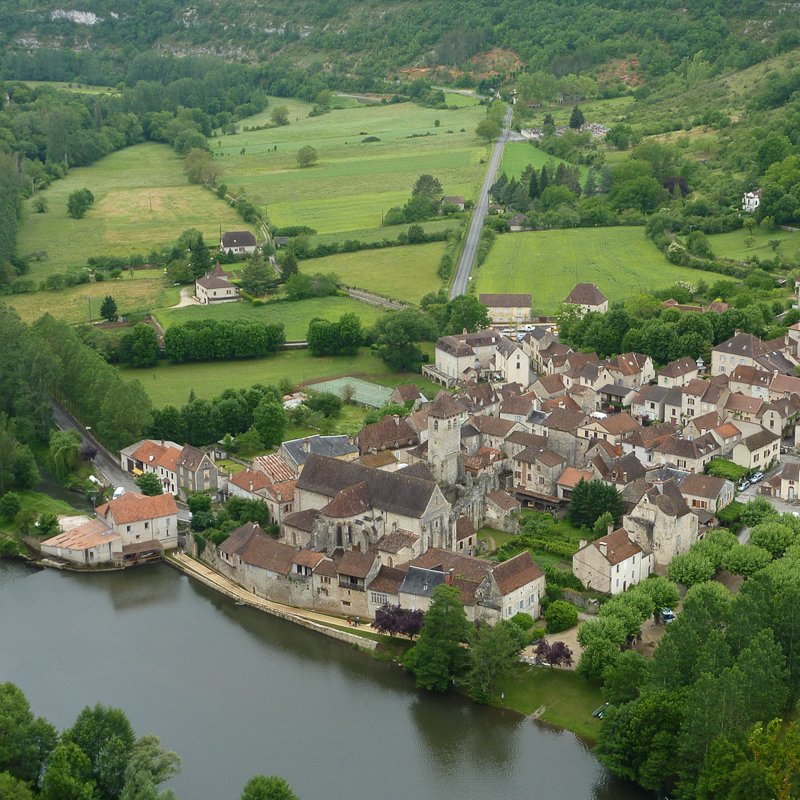 First off it’s a short forty minute drive to St. Leon in the Vezere valley and a picnic on the river bank to introduce the trip, go over the itinerary and generally break the ice. Down on the riverside we choose a picnic table under a parasol and settle ourselves down. The river is sliding by beside the weeping willows. Paul and I go inside to order the food and wine. We have a selection of cheeses and cold meats and a couple of bottles of wine. The violet confit adds an unusual touch. We keep going back for more bread as we sit in the sun and chat. Everyone seems easy-going and relaxed. We watch a couple of canoes slip by and it’s clear that the river should pose no problems. After the plates are cleared away the maps come out and Paul and I go over the trip. Everyone of course has read all about the trip on the website before booking. They’ve figured out that it suits them and the reason they aren’t doing the trip for themselves is that they want us to take the responsibility. It’s a bit tedious then to go over the trip like this. They do like to be reminded but after the first few days have been described and some places pointed out on the map it becomes obvious that the interest is failing. So we screw the map then (in fact I fold it properly) and suggest instead of driving to our hotel we could walk. Why not. A slow walk will take about an hour, although I have to point out that it is a gentle uphill all the way. Unsurprisingly everyone is up for a walk. After all they are here for an adventure holiday and not to sit about in the van. Paul of course will have to drive the van up the hill with all the luggage. That’s his lot as I don’t drive. That’s a cunning ploy devised when I was teenager and put off by the antics of my Dad and his ancient Morris Minor. That’s another tale. Before we set however we’ll have a little stroll around the village, and in particular, have a peek inside the local church which is just next to us on the river. I must try not to get too complacent about these types of things. How old is it? 11th Century I say. And added to later. It seems to work for most everything around here. 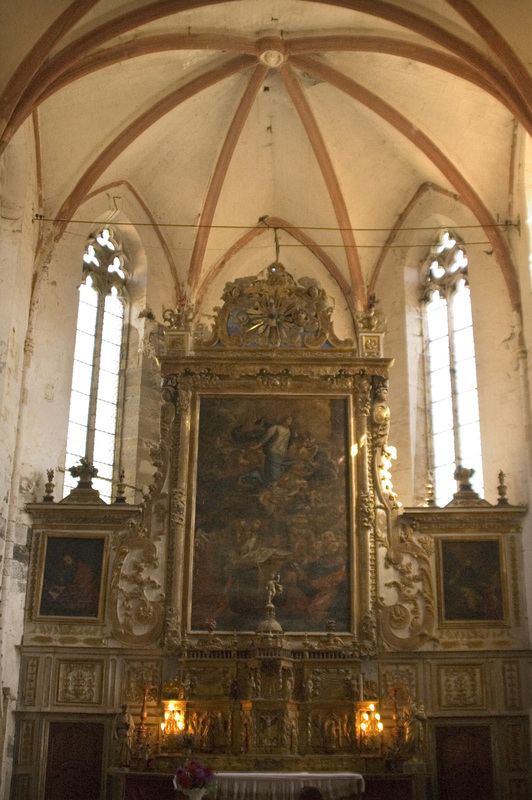 It’s a plain church and very simple inside. One of the ceilings has the vague smudging of an old mural recently revealed. It’s more imposing outside with the rounded end of the Romance style of architecture. The local yellow stone which ages to grey can look golden in the right light. The tall flowers planted around the base of the building relieve lines. Some scratches on the wall mark previous flood levels. One of them is chest height for me. The whole village must have been under water. The small village is clustered together around narrow lanes. Bright flowers erupt everywhere and tiny, sometimes overgrown, gardens come into view on the corners. It’s quiet around here too. The village is set off from the main road and is not therefore cursed by through traffic. I noticed a few cyclists at the picnic spot. Before we leave the village we wander back to the van so they can get their gear sorted out. Walking boot and cameras and things. Our walk winds it’s way out of the village and passed a large house. The roof of the local Château can be seen, but we will get a better view from the river tomorrow. This large house however is almost a castle or château in it’s own right. Behind an iris topped wall and through a gate designed like a portcullis can be seen a square bailey, with mullion arched windows and crenellated battlements. Who lives in this house? Up the walled road we pass our first Walnut Trees. These are ubiquitous around here. There are Walnut orchards everywhere as well as wild Walnut trees at every juncture. We shall get used to walnut at dinner time: in drinks, in salads and in desserts. As we continue up the road we pass a small chapel by the cemetery. The walls around the cemetery have been newly repaired and glow in that now familiar yellow. A peek over the wall reveals huge family sarcophagi with individual mementoes on top. Next door a new extension to the cemetery has been built. It is ominously huge. Unless the plague revisits this part of the world it should last for centuries. The trail then crosses the main road and starts to climb up a rocky track. It’s overgrown with familiar hedgerow shrubs: Blackthorn and Hawthorn, Wild Roses and Box. On either side a crumbled dry-stone wall is covered in moss. These walls remind us that these hills were formerly used for sheep grazing until it became uneconomic in the 1950’s. I’ve been told that dry-stone walls can last up to 200 years without attention and I’m guessing these were built sometime in the mid 19c. The houses that can be glimpsed either side of the trail reveal a more modern use for the land. They seem to be summer homes. One has a small swimming pool. At the top of the climb the trail breaks out onto a small lane and we turn left to follow the road past open meadows. They are overgrown now but will be scythed down in a matter of weeks to be turned into hay. For now though they are glowing with wild flowers and the buzzing of bees. The next junction sees us turn off the lane and onto a farm track with hedges either side. Now we have brambles and Traveller’s Joy beside us and we disturb several types of butterfly as we pass: some Blues, some Marbled Whites and some elusive Fritillaries lead the way. As we climb towards the farm buildings ahead of us we can turn to the right and see the village of St. Leon, it’s church and its château below us in the distance. We can see how the valley curves, but the river remains invisible. On reaching the farmhouse and the top of our climb we catch our breath. The farm looks tired an unused. No-one is about. May be it’s the time of day. However as the trail levels out we can see that a vegetable allotment has been carved into one of the fields. Someone must live here. For the final stretch the trail plunges into a wood and suddenly the path becomes very damp. We keep to the edge of the path but sometime resort to walking in the wood to avoid the yellow sticky mud. I notice that many of the trees are Sweet Chestnuts. The trees have been coppiced in the past but the wood is long overdue a cut. Further on the trail sides are covered in bracken and it’s about here that I have to look carefully for the side track that will take us to the Relais. It’s difficult to locate and when I do I have to go ahead and beat the bracken down. At one time the Relais was used mainly by travellers along the long-distance trail. These days the clientele more often arrive by car. It’s no wonder the trail is overgrown. Just before we arrive the trail turns along a bank and gives us another view into the valley. And then we arrive. Paul is here and has been busy unloading the luggage. The rooms are allocated, the fridge with the cold drinks is pointed out, everyone can see that the place has a swimming pool and we agree on a rendezvous time to leave for dinner. Paul and I can now enjoy some downtime. Lying on the beds in our shared room we chat about the trip ahead. Not too deeply though as we’ll get through by dealing with each day at a time and just making sure that we stay one day ahead of the game. In fact we just took a nap. At seven o’clock we roused ourselves to take our guest to dinner in the village. I asked if anyone wanted to walk down. They did. So we did. This time walking down the lane instead of taking the trail. It’s an easy stroll. Halfway down Paul passed with the rest of the group. We are having dinner at the Old Post Office and take a table outside on the road. The menu of course causes a few wrangles but once we have explained that almost every dish is duck everyone settles down. We calm a potential furore about choosing the wine by pointing out that they have pichets on the wine list. That’s easy. We explain that we are paying for the standard menu, but you can have what you like and pay the difference. For drinks and the like Paul and I will run a tab and bill everyone from time to time. Lubricated by sufficient alcohol the first evening and dinner seems to go well. People are talking and smiling. We have a few questions about what we are doing tomorrow but it seems nobody is being very picky and asking those impossible to answer questions. I restrain myself about being obtuse. If someone asks how long is the paddle it’s very tempting to quip back and say it depends how fast they paddle or it depends on how fast the river is. When I get to know these people later than I can start being cheeky. For now I just stick with averages and say that we are under no pressure to race down the river. On the contrary we are here to enjoy it. By the time dinner is done it is knocking on 10 o’clock in the evening. It’s time to drive back up the hill to the Relais. Fortunately no-one wants to walk. It’s my duty to accompany anyone who does and so I’m relieved that we are all jumping back in the van. Pretty soon we are back in our room. Lights out. Time for Paul to knock around all night and claim not to be able to sleep. He dreams that he is awake. In fact we lie awake for hours musing on the trip. We have to turn the trip around to become something less prosaic than a simple meander down some of Frances calmest and greenest rivers. We have to liken it to Scott. But then we’d have to die. So then we come up with Shackleton. Frozen canoes and open sea voyage beckon. But then, the genius, we come up with Apocalypse Now. Our rivers will become the Mekong. We’ll forget the fact that we are supposed to go upstream. Who would do that in a canoe? What will be our Cambodia. What is our mission. Who will be Willard and who Kurtz. We begin to riff on this as the night lengthens. It’s possible we fall asleep and then get the riff going again in the early morning when neither of us can sleep. Remarkably one of the guys on the trip has a Martin Sheen look about him: Mitch is our man. We haven’t found out much about him yet. He has told us his days as a motocross rider and how his legs are all smashed up. He has a military look too. Cropped hair and a look that says he might kill you. May be not, he seems like a nice bloke. Now all we need is to fill out the rest of the crew. And we need some quotes. We spend sometime racking our heads to remember lines from the film. So we have our setting. We have a crew, of sorts, and we have our mission. What we don’t have is sleep. What we need is sleep. I sleep. Paul doesn’t. Probably because I’m snoring. 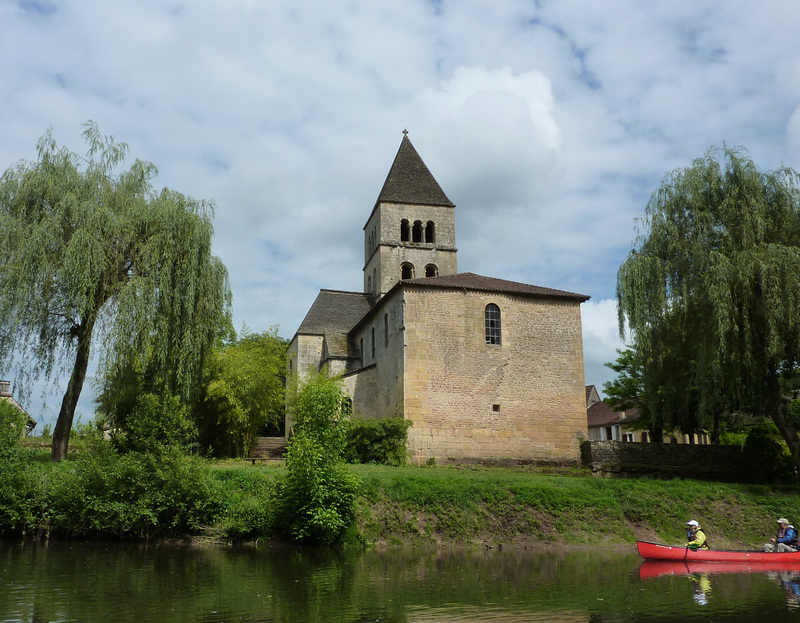 This entry was posted in Inn-to-Inn Guided Canoe Trips and tagged Canoe, France, Guided, Holiday, Inn-to-Inn, nature, outdoors, Perigord, St. Leon-sur-Vezere, Trip, Vacation, Vezere on February 20, 2013 by Green River Canoes Ltd. 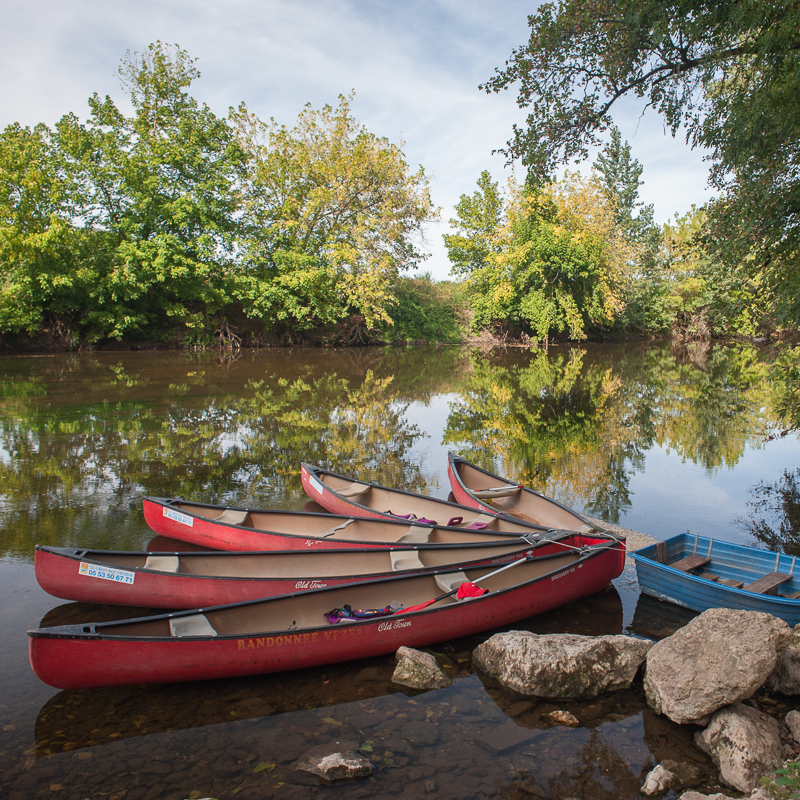 Welcome to the Green River Canoes blog. We are a company offering Inn-to-Inn Guided Canoe Trips in the south of France. Our main website is here. 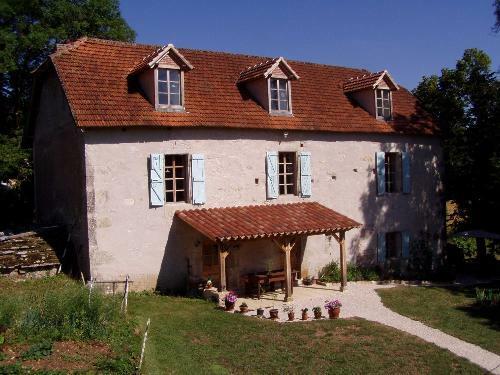 We are currently offering a 6 Day Trip in the Perigord region on the Vezere and Dordogne rivers and a 5 Day Trip in the Lot region on the Cele river. A combination 12 Day, 3 Rivers trip is also available. Bespoke/Custom Trips can be arranged if required. Here are some ideas. All our holidays comprise of mostly canoeing with some (often optional) hiking. The itinerary is planned but is flexible enough to be changed on the day if required. These are detailed here for the Perigord trip and here for the Lot Trip. All our holidays are guided. Our guests will be accompanied on the river and trail by an experienced guide who knows the area and rivers well. Our other guide will accompany us in the background by driving our vehicle between lodgings. When necessary this vehicle will be transferring our luggage, rendezvousing with us for lunch and generally being available as and when needed. 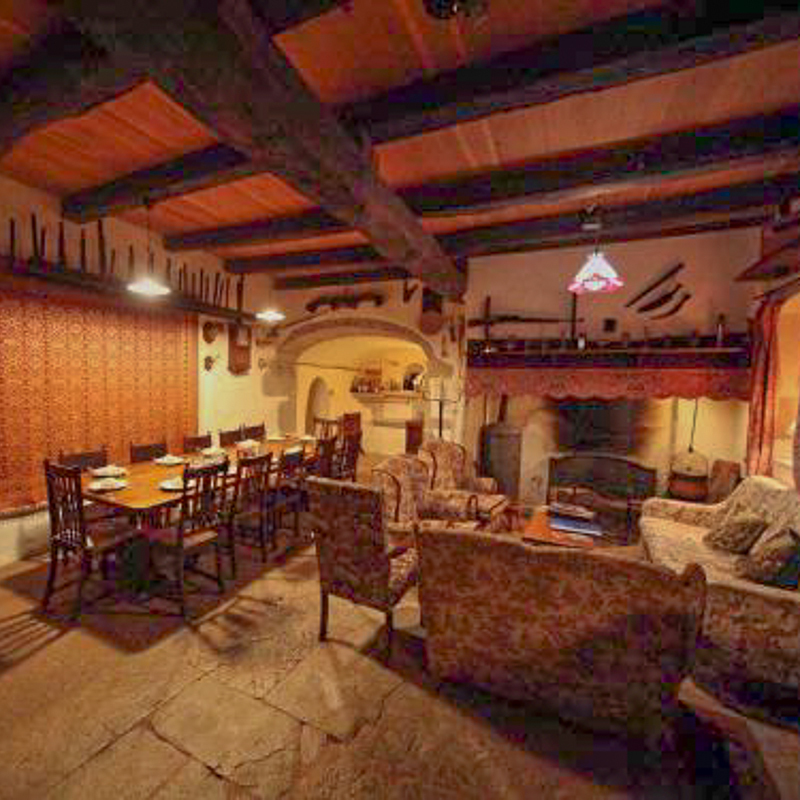 All the accommodation on our trips is in small local Hotels, Chambre D’Hotes or B&Bs, which are detailed here for the Perigord trip and here for the Lot trip. All our holiday prices include transfers, canoe hire, accommodation and meals (except one). All trips have a maximum size of 9 people. That is 7 guests and 2 guides. On all our trips we will enjoy the natural history and local history of the region and see many of the fabulous sites along the way. Needless to say we will also enjoy the local wines and regional cuisine. We take trips from late spring, through summer (avoiding August) until the autumn and fall. When to go? These books and maps will also help you enjoy the trip. More detailed questions are answered here. If you have any other questions we would be delighted to hear from you. All the details are on the panel to the right, where you can also sign-up for our quarterly Newsletter. This entry was posted in Inn-to-Inn Guided Canoe Trips and tagged Canoe, France, Guided, Holiday, Inn-to-Inn, Trip, Vacation on January 23, 2013 by Green River Canoes Ltd.